USES: This medication is used to treat acne. It may decrease the number and severity of acne pimples and promote quick healing of pimples that do develop. 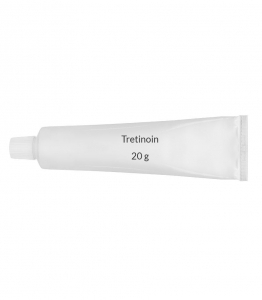 Tretinoin belongs to a class of medications called retinoids. It works by affecting the growth of skin cells. OTHER USES: This section contains uses of this drug that are not listed in the approved professional labeling for the drug but that may be prescribed by your health care professional. Use this drug for a condition that is listed in this section only if it has been so prescribed by your health care professional. Other forms of this medication are used to improve the appearance of the skin and minimize fine wrinkles. Your doctor may also use this medication to treat other conditions. HOW TO USE: Read the Patient Information Leaflet if one is available from your pharmacist. Consult your doctor or pharmacist if you have questions. Wash your hands before applying this medication. Gently clean the affected skin with a mild or soapless cleanser and pat dry. Use your fingertips to apply a small amount of medication (about the size of a pea) in a thin layer, usually once daily at bedtime or as directed by your doctor. A gauze pad or cotton swab can be used to apply the liquid. For some preparations, you should wait 20-30 minutes after cleaning your face before applying this medication. Consult the label directions, the Patient Information Leaflet, or your pharmacist if you have any questions. Use this medication on the skin only. Do not apply to the inner lip area or inside the nose/mouth. Do not apply to cut, scraped, sunburned, or eczema-affected skin. Avoid getting this medication in your eyes. If this medication gets into your eyes, flush with large amounts of water. Call your doctor if eye irritation develops. Wash your hands after using the medication to avoid accidentally getting it in your eyes. During the first few weeks of using tretinoin, your acne might appear worse because the medication is working on pimples forming inside the skin. It may take up to 8-12 weeks to notice results from this medication. Use it regularly in order to get the most benefit from it. To help you remember, use it at the same time each day. Do not use a larger amount or use it more frequently than recommended. Your skin will not improve any faster, and it will increase the risk of developing redness, peeling and pain. This medication is available in different strengths and forms (e.g., gel, cream, solution). The best type of medication for you to use will depend on the condition of your skin and your response to therapy. Inform your doctor if your condition persists or worsens. SIDE EFFECTS: A brief sensation of warmth or stinging may occur immediately after applying the medication. Skin redness, dryness, itching, scaling, mild burning, or worsening of acne may occur during the first 2-4 weeks of using the medication. These effects usually decrease with continued use. A daytime moisturizer may be helpful for excessive dry skin (see Notes). If any of these effects persist or worsen, notify your doctor or pharmacist promptly. Your doctor may want you to decrease how often you use tretinoin, change the strength or type, or have you stop using it. Remember that your doctor has prescribed this medication because he or she has judged that the benefit to you is greater than the risk of side effects. Many people using this medication do not have serious side effects. Notify your doctor if you experience: blistering, crusting, severe burning/swelling of the skin, eye redness and watering (conjunctivitis), eyelid swelling, skin discoloration. A very serious allergic reaction to this drug is unlikely, but seek immediate medical attention if it occurs. Symptoms of a serious allergic reaction may include: rash, itching/swelling (especially of the face/tongue/throat), severe dizziness, trouble breathing. This is not a complete list of possible side effects. If you notice other effects not listed above, contact your doctor or pharmacist. In the U.S. - Call your doctor for medical advice about side effects. You may report side effects to FDA at 1-800-FDA-1088. In Canada - Call your doctor for medical advice about side effects. You may report side effects to Health Canada at 1-866-234-2345. PRECAUTIONS: Before using tretinoin, tell your doctor or pharmacist if you are allergic to it; or if you have any other allergies. This product may contain inactive ingredients, which can cause allergic reactions or other problems. Talk to your pharmacist for more details. Before using this medication, tell your doctor or pharmacist your medical history, especially of: eczema. This medication may make you more sensitive to the sun. Avoid prolonged sun exposure, tanning booths, and sunlamps. Weather extremes such as wind or cold may also be irritating to the skin. Use a sunscreen daily, and wear protective clothing when outdoors. Wait until your skin has completely recovered from a sunburn before using tretinoin. Avoid electrolysis, waxing and chemical depilatories for hair removal on the treated areas while using this product. If you have recently used products containing sulfur, resorcinol or salicylic acid, use tretinoin with caution. Wait until the effects of such products on the skin have decreased before using tretinoin. This medication is not recommended for use during pregnancy. Discuss the risks and benefits with your doctor. It is not known whether this drug passes into breast milk. Consult your doctor before breast-feeding. DRUG INTERACTIONS: See also Precautions section. Drug interactions may change how your medications work or increase your risk for serious side effects. This document does not contain all possible drug interactions. Keep a list of all the products you use (including prescription/nonprescription drugs and herbal products) and share it with your doctor and pharmacist. Do not start, stop, or change the dosage of any medicines without your doctor's approval. Some products that may interact with this drug include: hair perming solutions, alcohol/lime/menthol-containing products (such as astringents, toners, shaving lotions), medicated or abrasive soaps and cleansers, products containing sulfur, resorcinol or salicylic acid, products containing alpha hydroxy acid, products containing glycolic acid, soaps and cosmetics with a strong drying effect, other drugs that may increase your sensitivity to sunlight (e.g., fluoroquinolones such as ciprofloxacin, tetracyclines, thiazide water pills such as hydrochlorothiazide, sulfa drugs such as sulfamethoxazole, phenothiazines such as chlorpromazine). Benzoyl peroxide can be very irritating and may decrease the effectiveness of tretinoin if the two products are applied at the same time. Talk with your doctor or pharmacist about the safe use of prescription and non-prescription benzoyl peroxide products (e.g., Pro-Activ, Clearasil). OVERDOSE: If overdose is suspected, contact your local poison control center or emergency room immediately. U.S. residents can call the U.S. national poison hotline at 1-800-222-1222. Canadian residents should call their local poison control center directly. This medicine may be harmful if swallowed. Symptoms of overdose may include excessive redness, peeling, and discomfort. NOTES: Do not share this medication with others. Cosmetics may be used, but clean skin thoroughly before applying the medication. Some cosmetics and soaps may worsen your acne. Moisturizers may be safe to use. When buying cosmetics, moisturizers or other skin care products, check the label for "non-comedogenic" or "non-acnegenic." These products are unlikely to worsen your acne. Ask your doctor or pharmacist which products are safe to use. Remember, acne is not caused by dirt. Cleaning your skin too often or too vigorously can irritate your skin and worsen acne. MISSED DOSE: If you forget to use this medication, use it as soon as you remember if you remember the same day. If you don't remember until morning, wait until your next dose is scheduled. STORAGE: Store at room temperature between 59-77 degrees F (15-25 degrees C) away from light and moisture. Gel preparations are flammable. Do not expose to heat or fire sources. Do not smoke during use. Keep all medications away from children and pets. Do not flush medications down the toilet or pour them into a drain unless instructed to do so. Properly discard this product when it is expired or no longer needed. Consult your pharmacist or local waste disposal company for more details about how to safely discard your product.